Easy to start and ride. Highly recommended this for a beginner rider. I bought this for my grandson. I have used powersportmax several times and the products are exactly what is described. My grandson loves his ATV. I received the ATV I purchased for my Grandson on time and as promised. It's a perfect beginner ATV and seems to be of good quality. I love the remote kill switch especially for new riders. The original remote kill switch didn't function properly and they replaced it almost immediately. The replacement one is better than the original one with better features. Putting it together was fairly straight forward especially with the dvd that was included to assist me. You are not going to beat the value of this ATV for the price. Value wise, you can't beat these products. Young and new riders will get all they want out of this 110 cc unit. I purchased two of these for my boys. Just the right size for the little guys just learning. Haven't had to use the remote stop yet, as they are careful riding in the field. I like that I can control the speed with the throttle adjustment screw. only a minor issue with one tire not holding air overnight. May have to buy a tube for it. The second 4 wheeler had a defective starter relay, but a replacement is on the way. A good buy for the money spent compared to the big name units. A good beginner/learning unit for the little guys. I would suggest one of these for starters. The 110 ATVhas been a great investment for my kids. My son has really got a handle on riding it. It has started every time. There has only been two issues. 1st was one of the tires was deflated on arrival. I have filled the tire multiple times. It kept going flat. Finally took it to a tire shop at it had a very small leak in the side wall. They patched it the best they could, but I think I will have to buy a new tire. Second thing was the foot brake stopped working. I finally followed it and somehow it became disconnected. I reconnected it and have had no problem since. Assembly took around an hour to complete. Nothing complex. I did notice a crack in some plastic on the left front wheel fender. Not sure if my kid put his foot on it, but the plastic was all intact when I bought it. I do wish that the machine had a reverse. Overall I am very happy with the purchase. I think this machine is worth the purchase. Runs well. Lets the young ones learn to ride without costing an arm and a leg. Fast shipping on the ATV, assembly was straight forward and easy. My daughter loved the pink camo of course, and it hasnt skipped a beat yet mechanically. Def. one of the best deals going for an ATV of this size. Hard to beat the deal here, fast shipping, easy to assemble. 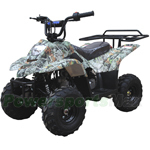 I am very please of the atv I have purchased for my grandson, he is also very happy with the atv, it was priced very reasonably, an the safety features are very good,I would highly recommend purchasing from powersportsmax, customers service is great with helping you choose the right atv for your needs. And also very helpful with choosing a helmet for my grandson.. When I bought this item four month ago. I was very happy with the quality. It has never broken down in those four month. Best thing I have ever purchased. It was easy to buy and pay for the wheeler. It was shipped out very fast and i revived it faster then they even estimated which was great. It came on a 18 wheeler and the driver called me ahead of time so i knew when it would be arriving. Even when i had noticed that i did not get something with my ordered that i ordered, i mailed them right away and they got back to me ASAP about it and mailed it right out. My daughter is 4 1/2 and she loves her wheeler more then anything. We love everything about this wheeler she has except that we have had problems with the brake caliber sticking and the clutch handle was to hard for her to pull in as she has small hands. Great product sturdy and strong had it for a couple of months no problems.